David, my cousin, will always answer to others when the question is poised, 'why it is we did not see each other for the good part of 30 years?'. "They (meaning my portion of the tree) were the black sheep of the family", he'll say. That would be funnier if it weren't so painfully true. Though it is humorous to David and myself - but probably only achievable due to time and the passing of generations. And the fact that we recognize it to be true. There are lots of theories as to why we were the outcasts. No matter which one you choose, they all pretty much lead back to my paternal grandfather. My great-grandfather (my grandmother's father) was, for all intents and purposes, a big-wig about town. Definitely in his community. I don't think it's any secret he was not fond of my grandfather nor the relationship of my to-be grandparents. For stories told though, my grandmother was one to buck her father - and wasn't thrilled with the idea of being the family great-grandfather (and great-great grandfather) had built. Allegedly, she fled town ran away to hopefully become a Ziegfeld girl (or the equivalent of), before being dragged back to Cleveland by her ear by her father. Her marrying my grandfather might have just been a big middle finger to her own father. Nothing would surprise me anymore. All of this is conjecture, of course. No one of my parent's generation actually would or could discuss such things in 'the family', so everyone resorted to rumours. The same is probably true for the "good side" of the family. My cousin Bill would tell me stories he only heard, but never corroborated. I'm hoping to sort some of it out - but it certainly won't be all of it. As my mother divests of things, I've inherited picture books, scrap books and home movies from my paternal grandparents. My sisters do not want them. We were separated from the "good side" of the family for so long, they have no ties to them at all. That's not a reflection on my cousins or my sister, just the gap that was put into play 90+ years ago. After my grandparent's deaths, there was no relationships really left with the rest of the family. It's a little sad, but it makes for a good story. 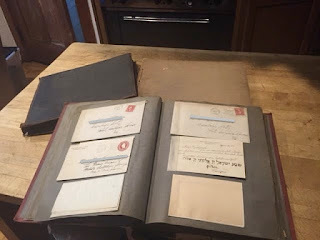 Anyhoo......it seems the scrapbooks start with my grandparent's wedding, and if the telegrams they received are the case, it was a surprise wedding - no doubt to throw off or spite my great-grandfather. ....but we shall see. I can totally see why people get hook on ancestry.com. My grandmother's family has been great about keeping an updated family tree for as long as I can remember, so everything is traceable....except for the anecdotes. I'm hoping these books will fill in some of the dots. family dynamics are weird; and every family has its quirks/weirdos/strangers. Family is interesting, especially the secrets. Fascinating. I hope you learn more. Genealogy is a fun pastime; I think it is important to know about our roots.